This was formerly the open land of Clockhouse (or Clock House) Farm, which was associated with the village of Woodmansterne and had eight cottages in the 19th century. Developers put up semi-detached houses here following the opening of Woodmansterne station in 1932 and Carshalton council built the Clockhouse estate before and after the Second World War, with local shops at Hillcrest Parade on the Mount. 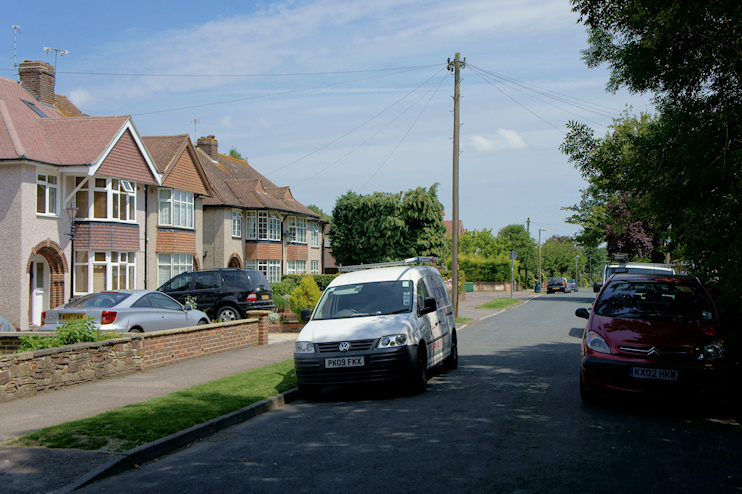 Locals often refer to the Clockhouse area as ‘the Mount’, after this central road, which is shown in the photo above. * Privately-built detached houses and council flats and maison­ettes later extended the diversity. The clock-topped farmhouse that gave the estate its name lay across the Surrey border in Banstead and was demol­ished in the 1970s to make way for more houses. Among the most recent additions are housing associ­ation properties next to the Methodist church on Whitethorn Avenue. Since a boundary change in 1993 Sutton council has operated the sport and recre­ation facil­ities at Corrigan Avenue. Located at the eastern end of Longlands Avenue, the almost rural Jack & Jill pub closed without notice in May 2018. At the time of writing it is not known whether it will reopen. 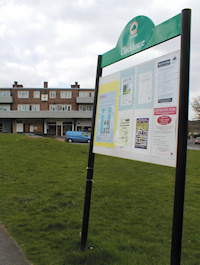 The only direct way to reach Sutton town centre is to walk (or of course ride a horse) along bridle­paths. Most young residents of Clockhouse are educated within the borough of Croydon, but local voters have overwhelm­ingly rejected the oppor­tunity to secede from Sutton. Clockhouse formerly had the lowest population of any ward in all the London boroughs but has since been amalgamated with parts of Carshalton. A 2004 attempt to use census data to measure happiness found that the ward of Carshalton South and Clockhouse was the second ‘happiest place to live’ in London. * The picture of The Mount at the top of this page is slightly modified from an original photograph, copyright Peter Trimming, at Geograph Britain and Ireland, made available under the Attribution-ShareAlike 2.0 Generic Licence.Any subsequent reuse of either image is freely permitted under the terms of that licence.